February is the month to ski and snowboard and this winter guests can do it for less at Mountain High. Use coupon code FEBEXPRESS to receive an adult 8-Hour lift ticket for just $39. That’s up to 50% off! Discount valid through February 28th, 2013. 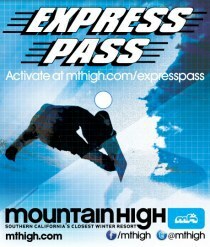 Limit one discount per Express Pass. Offer not valid President’s Day Weekend, February 16th – 18th. Purchase an adult 8-Hour lift ticket by February 15th and receive a FREE Express Pass plus a bounce back voucher for $39 on your next visit. Bounce back offer valid through February 28th, 2013. Offer not valid President’s Day Weekend, February 16th – 18th. -FREE 8-Hour Ticket (Non-holiday*) after every 4 visits. -TRACK your days ridden, total runs, vertical feet, and more. -ACTIVATE online and never wait in a ticket line again. -GUARANTEE your reservation in case of a sellout. -GO GREEN by reducing the waste from millions of discarded lift tickets each season. *Holidays: December 22-31, 2012. January 1-6, 19-21, February 16-18, 2013.